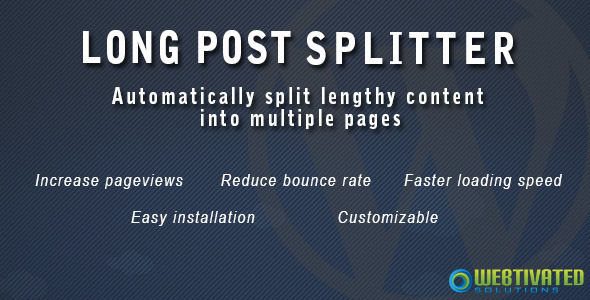 WordPress Long Post Splitter automatically split long post/page content into multiple pages so that the page length is smaller. Your page will load faster and make it easier for your readers to read your content without being overwhelmed by the length of the content. WHY SHOULD YOU SPLIT YOUR CONTENT INTO MULTIPLE PAGES? Write lengthy post – If your website contains many long articles, it is good idea to split your articles into multiple pages to make it more readable. Increase pageviews – If you split your article into multiple pages, every click by visitors to the next page will increase your pageviews. Reduce bounce rate – Website visitors are a curious bunch and just love to know what’s on that mysterious next page. Speed up page load time – Slow loading pages lead to poor user experience. Breaking down lengthy articles into pages will make your page load faster. If you have any problems or need help for this plugin, we are always here to help.